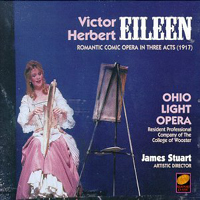 Studio Cast, 2012 (New World Records, 2CDs) (5 / 5) Producer Larry Moore traveled to Ireland to record this complete, sumptuous rendering of the 1917 Herbert operetta. 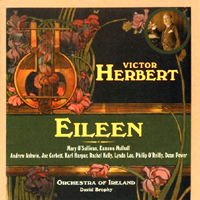 The Hibernian spirit comes through loud and clear; if you’re not Irish, you will be by the final chorus of “The Irish Have a Great Day Tonight.” Herbert’s orchestrations are luscious (so much harp! ), and the cast is excellent, with particularly fine work from Lynda Lee as Lady Maude and Dean Power as Dinny Doyle. Moore’s notes on the recording are informative, there are bonus tracks cataloging some beautiful cut material, and it’s all capped by a rousing orchestral suite. Plus, you don’t have to sit through all that uninteresting text, as with the Ohio Light Opera version. This would be a five-star recording but for one thing: David Brophy’s conducting tends toward the lethargic. “Too-re-loo-re” sounds like it’s heaving a one-ton weight behind it, and “Life’s a Game at Best” drags fearfully. — M.M.